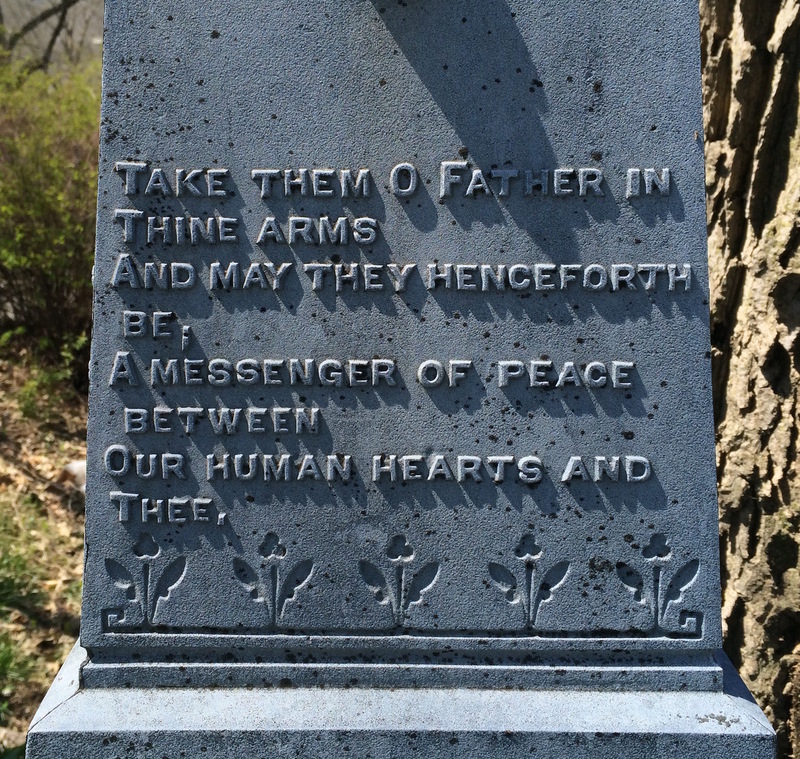 Last week, I talked about some of the many tree-style monuments at Fairview Cemetery. This week, I’m featuring white bronze markers because Fairview has a number of them. I’ve written about white bronze before but let me give you a refresher course. What is white bronze? Kevin Ladd of Stephen F. Austin University does a very good job at explaining it all but I’ll try. White bronze is actually not bronze, but is made up of mostly zinc, with different amounts of copper and tin. Today, zinc is often used in jewelry as a substitute for nickel. As you can see in the picture below, it has a bluish gray look to it. 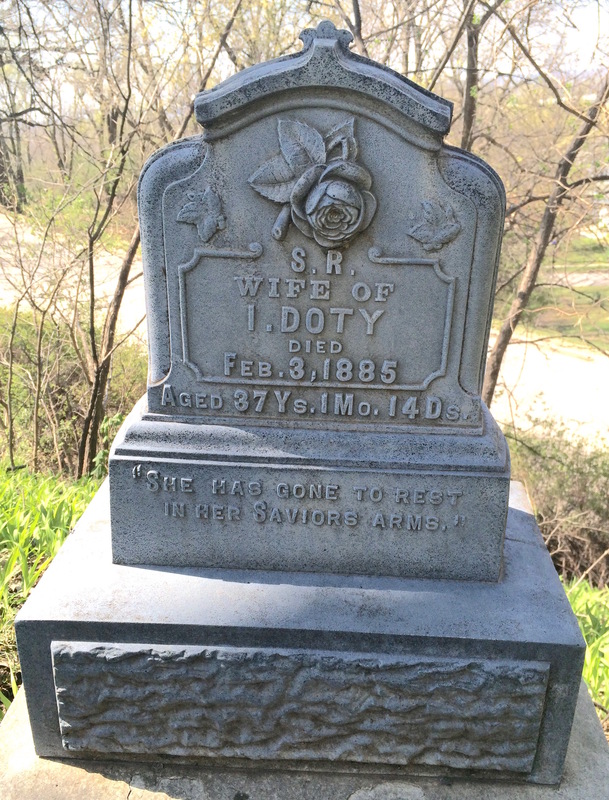 A native of Virginia, Solonia Clatterbuck Doty died at the age of 37. Her husband, Isaac, was a Civil War veteran. This is a good example of a smaller white bronze monument. Made by the Monumental Bronze Co. of Bridgeport, Conn. from 1874 to 1914, these markers were sold with the claim that they would last longer, cost about a third of an equivalent marker carved from stone, and look modern. It was called white bronze as a marketing ploy to make it sound more attractive. You selected exactly what you wanted from a catalog and could place an order with a local sales agent. A reader who saw last week’s blog contacted me with some interesting information on Monumental Bronze salesmen. Men who sold white bronze in the Seattle, Wash. and Portland, Ore. areas continued to sell stone markers as well. 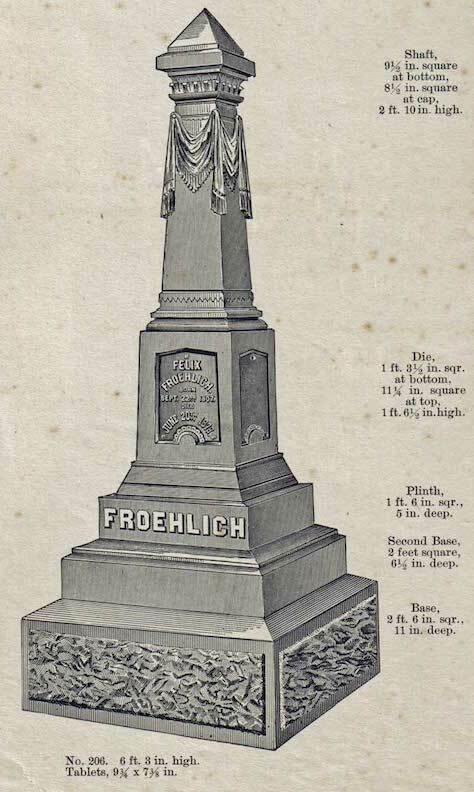 In addition to selling from a catalog, they often purchased a white bronze themselves and had it on a grave at a local cemetery so clients could see one for themselves. So it’s possible Lawrence Kelly (mentioned last week) could have sold white bronze monuments in Council Bluffs. This is just one example of the many white bronze monuments you could choose from, tailored to meet your exact requirements. The Monumental Bronze Co. operated offices in Detroit and Des Moines. They were quite popular in the Midwest but I rarely see them in the Southeast. If you look at the base of one, you can sometimes find out exactly where it was produced. 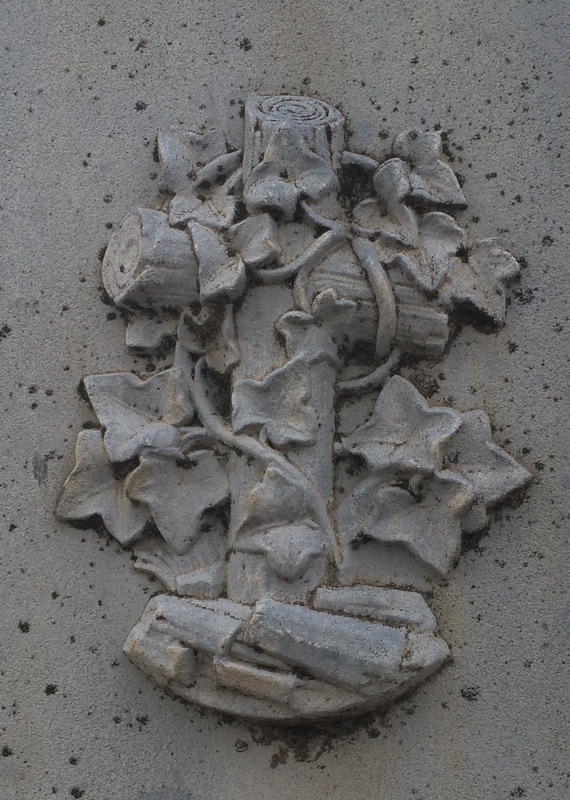 This is on the base of one of Fairview’s white bronze monuments. 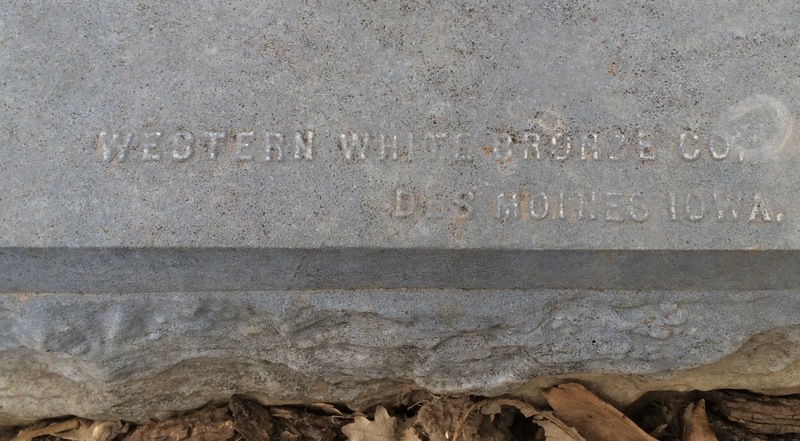 Western White Bronze Company opened in Des Moines in 1886 and closed in 1908. In 1914, the government took over the plant to manufacture munitions during World War I. The company mass produced them using molds. Individual sections could be bolted on so custom panels with text or symbols could be added. Customers could change the panels later if other family members died and could be laid to rest at their monument. 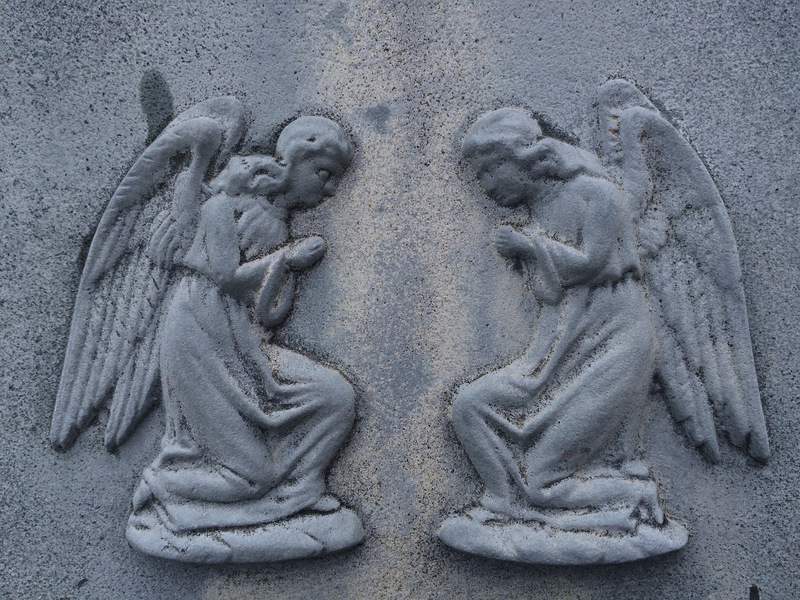 White bronze monuments weather very well and often look as good today as they did when they were first installed. They age better than marble, and are equal to the lasting qualities of granite. Maybe that’s one of the reasons I like them so much. The inscriptions don’t wear off. 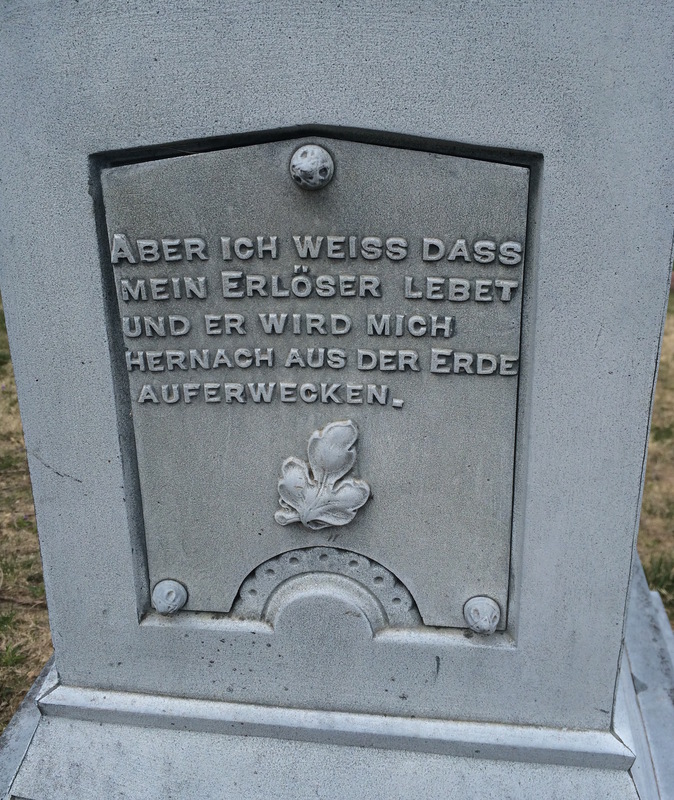 White bronze markers are actually hollow, and consist of vertical panels held together by screws at the corners. If you tap on it, you can hear the metallic hollow sound. They came in all manner of shapes and sizes from very small to huge monuments. I’ve seen many variations and they always fascinate me. 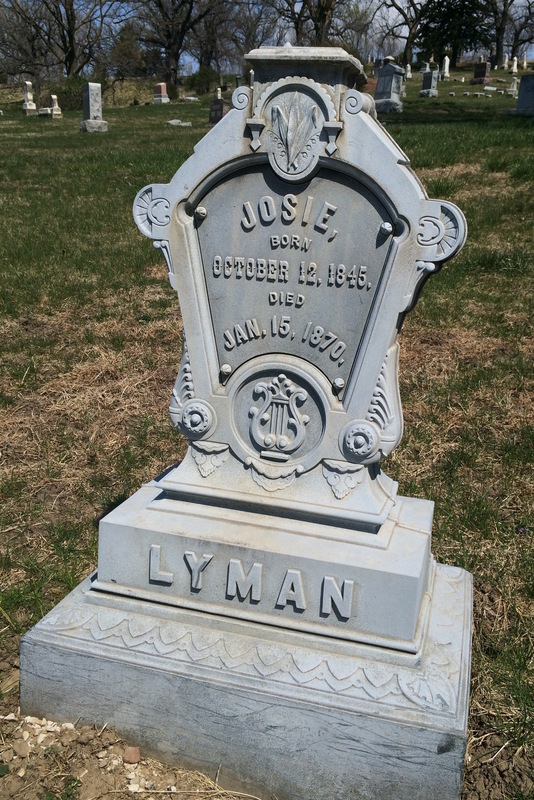 Josie Lyman was the wife of Joseph Lyman, congressman (1885-1889) and lawyer, who practiced in Council Bluffs. Above her name you can see the lily of the valley, a symbol of rebirth. So what brought white bronze markers to an end? World War I came and the demand for metal for munitions stopped production. After the war, demand for these monuments faded but Monumental Bronze kept making individual panels for family members who died after the monuments were ordered. The company made castings for automobiles and radios until it closed in 1939, ending a unique chapter in funerary art. I’m not the only person who wishes they still existed because of their versatility. They really do stand the test of time and are great resources for genealogists. 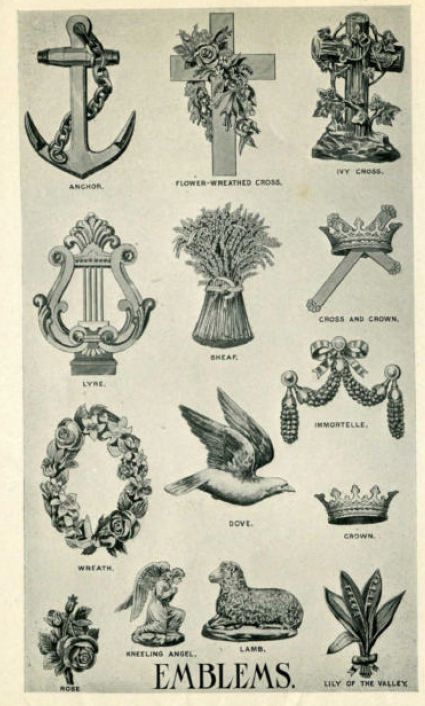 This page from a Monumental Bronze catalog shows just a handful of the emblems you could choose from. Notice the lyre that’s featured on the Lyman monument. The most common style of white bronze monument I’ve seen is the one pictured below. It can be small or quite large. I could spend an entire blog post dissecting this one for Anders “Andy” Ellitsgaard. I’ve included the images on its sides. Anders “Andy” Ellitsgaard’s cause of death remains a bit of a mystery. A native of Denmark, Anders “Andy” Ellitsgaard arrived in America in 1880 at the age of 20. He married Minnie Jensen, also a Danish immigrant, sometime after her arrival in 1887. She may have been from his village in Denmark. In 1890, she was pregnant with their child. At first, I thought Andy might have died while in the military. 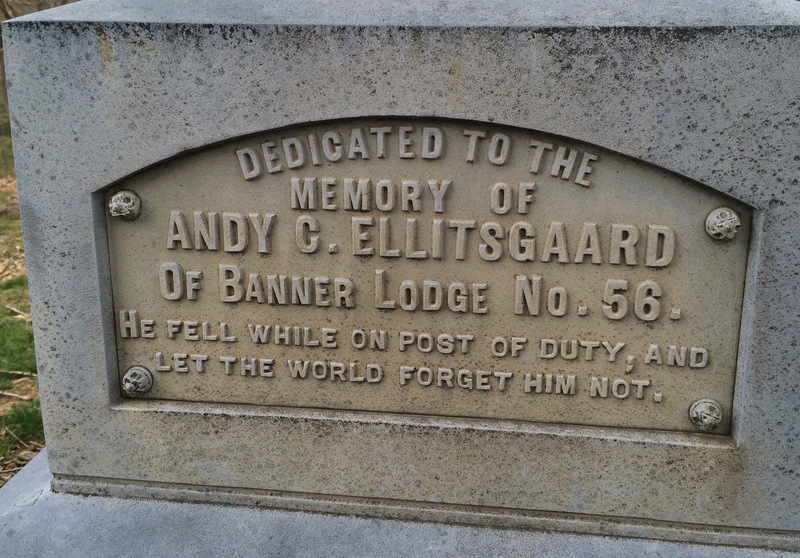 Andy passed away on June 23, 1890. At first I thought it was probably from wounds sustained in the military because his monument says “He fell while on post of duty, and let the world forget him not.” But I now believe he was in some kind of railroad accident. 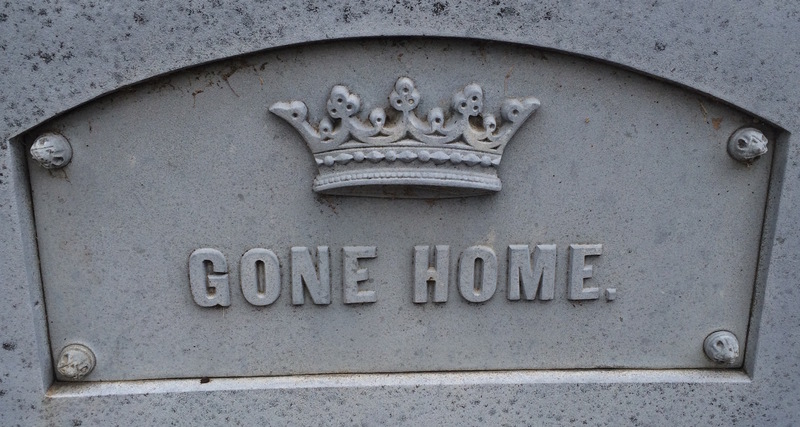 “Gone Home” with the crown above it was one of many sayings or phrases one could choose. If Andy had a policy through Banner Lodge No. 56, it might have paid for the monument. Andy’s monument indicates he was a member of Banner Lodge No. 56, which was a part of the Brotherhood of Locomotive Firemen and Enginemen. It was a railroad fraternal benefit society and trade union from the 1870s into the early 1900s. Banner Lodge No. 56 was based in Stanberry, Mo. and had members in the Council Bluffs area. I’ve seen many monuments depicting this scene so it must have been quite popular. Another frequently chosen motif was the ivy-covered log cross. There are even logs at its base. Not surprising since Andy was cut down in his prime. Andy never got to see his son, also named Anders, who was born just a few months later. Minnie remarried and moved to Colorado with Anders. The white bronze monument for Wilheminne “Minnie” Klopping is similar to Andy’s but a bit fancier. A number of images adorn the sides. 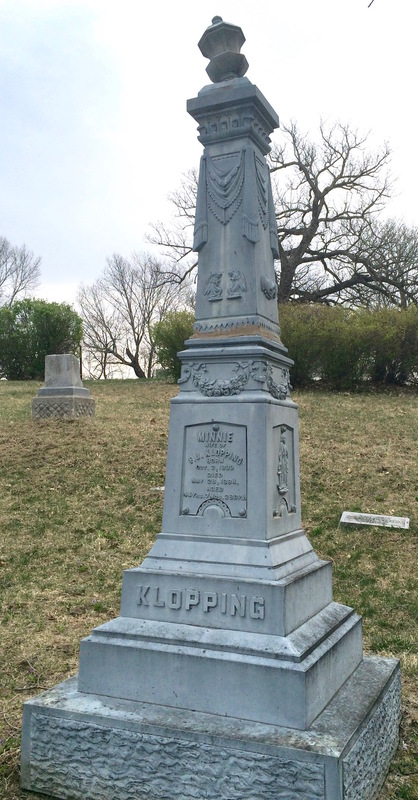 A native of Germany, Minnie Klopping was 44 when she died. You can see that the finial at the top looks to be broken. Minnie and Frederick were both German immigrants. I’m not sure if they had any children because records are spotty. In 1886, Frederick remarried to Louise Dreier and they had at least six children. Both Frederick and Louise are buried at Fairview beside Minnie. 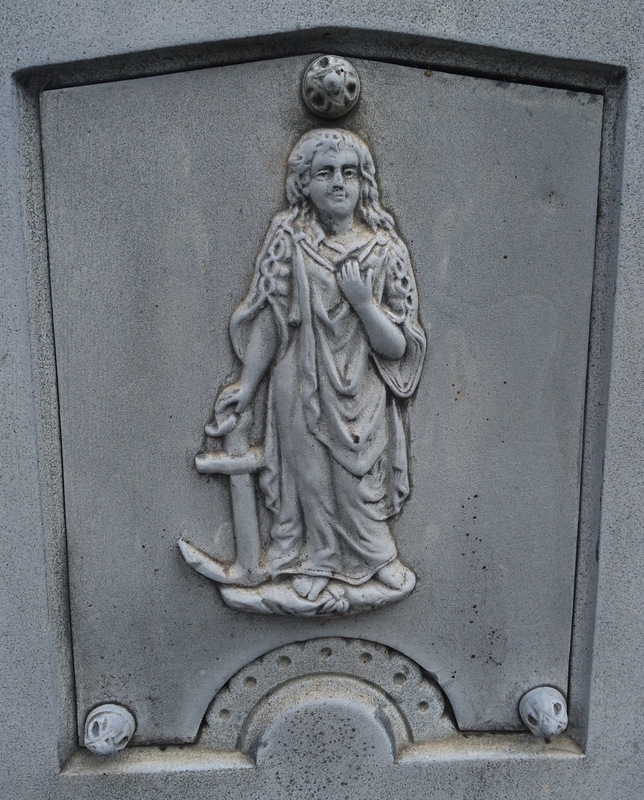 A woman holding an anchor was one of the motifs one could choose from. It often meant hope or eternal life. 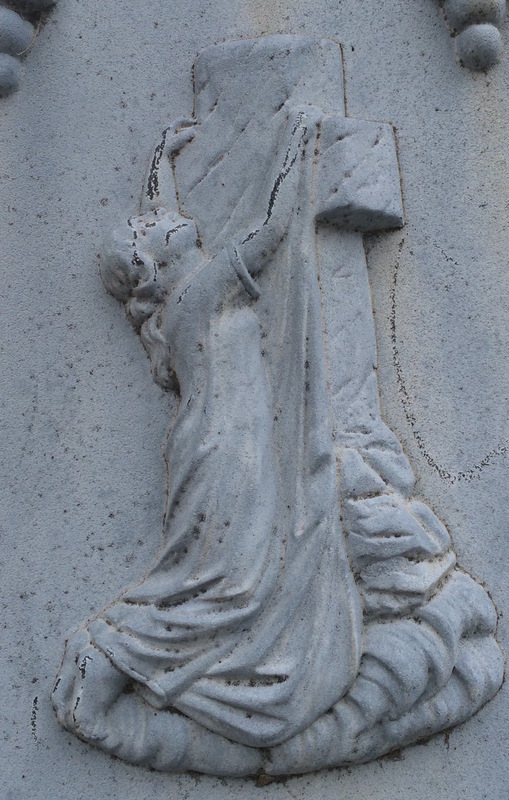 Another motif was a woman pointing upward, which is also on this monument. This is the first time I’ve seen kneeling angels on a white bronze monument. A white bronze monument enabled families to choose many different ways to commemorate their loved one. Even in their own language. This next monument is a similar style but was purchased for a mother and her daughter, who died four years apart. Anna and her daughter Leuella died four years apart. A native of Michigan, John Sylvester Flageolle was 24 when he married Anna A. Homer in Council Bluffs on Jan. 13, 1882. She was 18, born and raised in the Dakota Territory. She gave birth to their first child, Leuella, in January 1883. 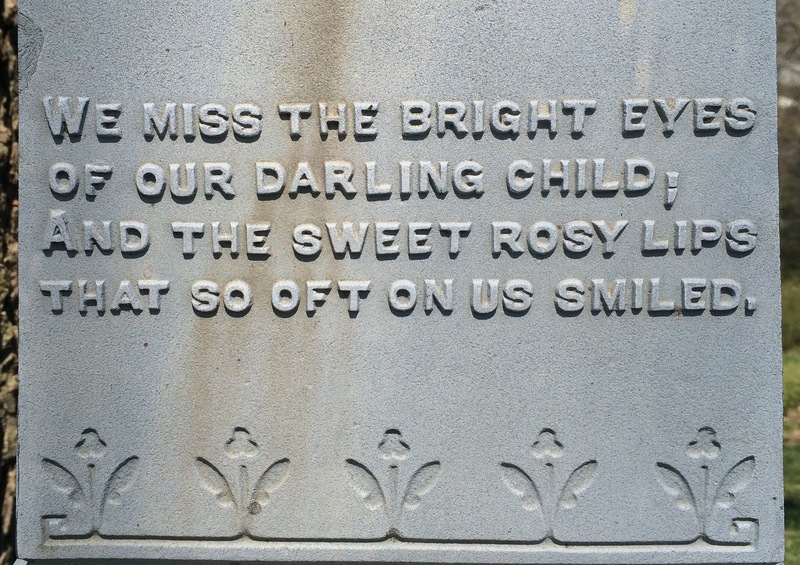 The little girl died only eight months later on Aug. 8, 1883. 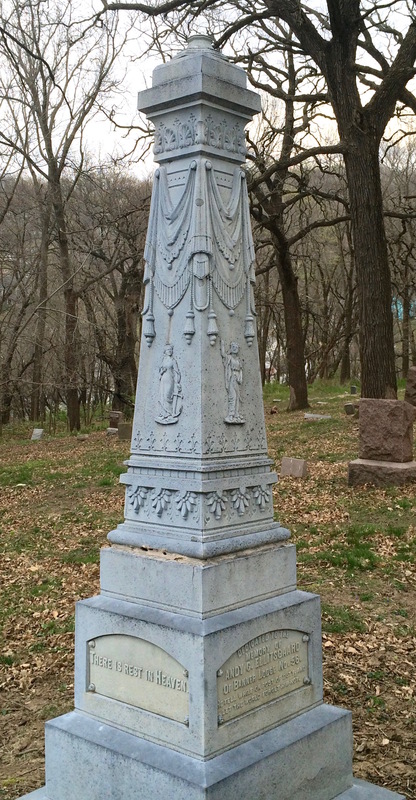 It’s likely the portion of the monument seen below was created soon after Leuella died. This plate was created for the baby, Leuella Flageolle, who died in 1883. James and Anna had two more children, Pearl and William, before Anna died on June 9, 1887. I believe that this was when this inscription was added to honor Anna’s life. Anna died in 1887, having had two more children with James. This plate was added after her death, commemorating her life and little Leuella’s. One of the more detailed motifs was chosen for this monument, an angel guiding a ship of some kind with a reclining woman or child on a bed. There’s one other white bronze monument with the same motif at Fairview. I’ve not seen it anywhere else. 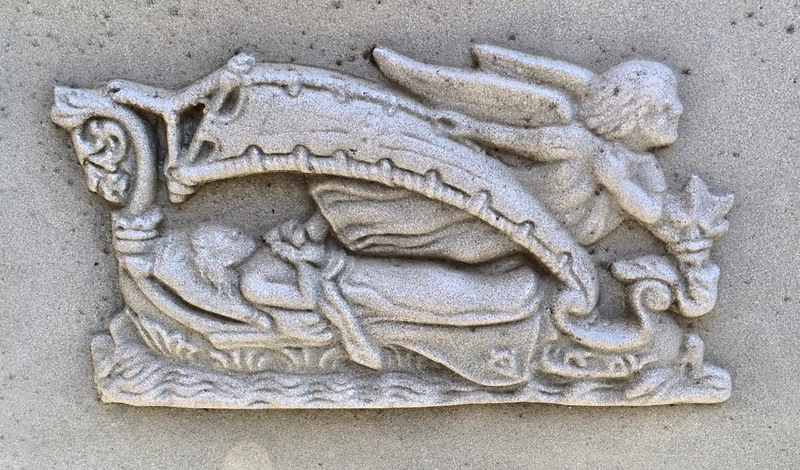 An angel appears to be guiding a ship bearing the deceased toward a new horizon. In 1892, James married Anna’s older widowed sister, Lavinia Homer Rolland. She had two children of her own. They moved to the Dakota Territory and later settled in Colorado. They had five children together. James died in 1944 and Lavinia died in 1941. 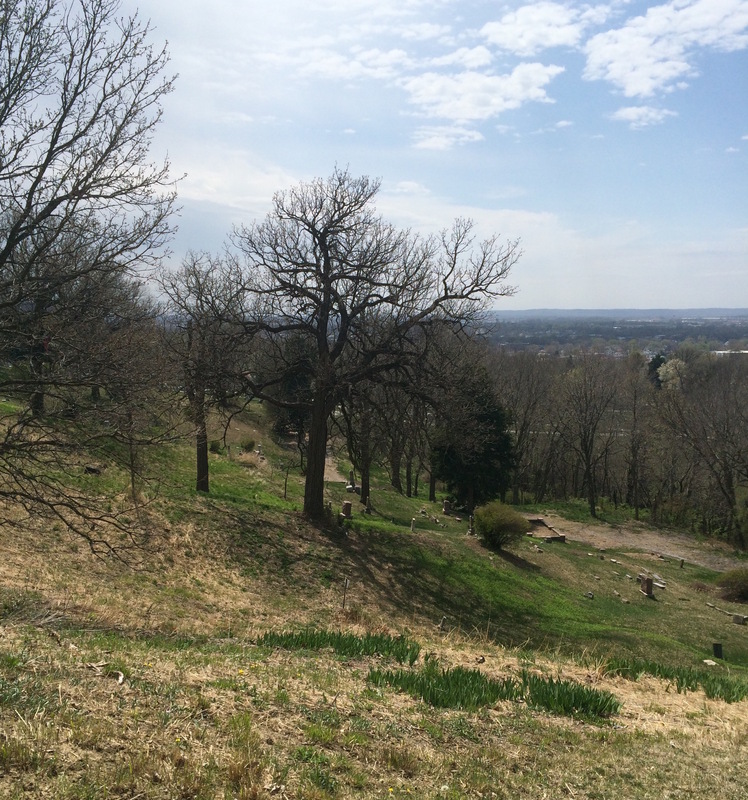 Next week, I’ll wrap up my series on Fairview Cemetery by exploring the back hillside where some of the loneliest vistas are found. 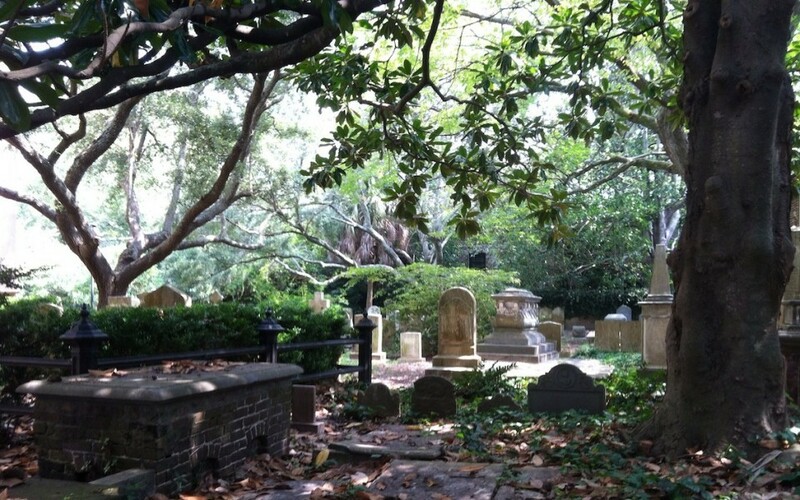 I love all the blogs on the Cemeterys you visit, you always have historys on the stones and people . this one about white bronze was most interesting…I wish now days they did such beautiful work instead of some of the bland ones they do but then if you think how much they charge for the bland ones very few of us could afford the other kind i guess….THANK YOU SO MUCh for sharing your adventures and knowledge…. Thank you so much, Mariena! Glad you are enjoying the blog. I enjoy finding out more about the people whose markers I photograph. It just brings it home that every life has meaning and should be remembered. The woman clinging to the cross that you mention as quite common was from a famous print painting called Rock of Ages that was mass produced and often hung in Victorian homes. Yes, Larry, you’re right about that.I read that when I was doing research earlier this year but forgot until you mentioned it. Another great blog Tracy, I always enjoy and always learn!